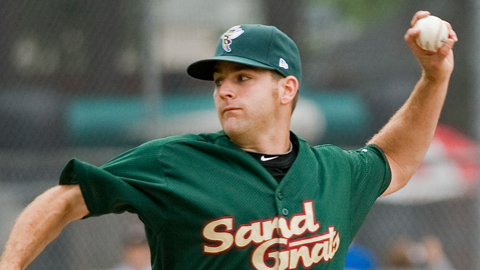 Brandon Moore, Jimmy Fuller and Mark Cohoon, who have helped Savannah post the Minor Leagues' top team ERA, are among six Sand Gnats named to the Southern Division team for the South Atlantic League All-Star Game. Joining the trio of pitchers are Sand Gnats catcher Kai Gronauer (.255, 2 HR, 16 RBIs), shortstop Wilmer Flores (.295, 5, 39) and outfielder Juan Lagares (.297, 4, 34). The Hickory Crawdads have six representatives on the Northern Division roster, which was unveiled Monday. The midseason classic will be played on June 22 at Fluor Field, home of the Greenville Drive. Moore (2-4, 2.29 ERA), Fuller (5-2, 1.70) and Cohoon (5-1, 1.62) rank 1-2-3 in the league in strikeouts. They anchor a pitching staff whose 2.43 ERA is more than half a run better than any other SAL team. The Lexington Legends have four All-Stars, including the productive trio of outfielder J.D. Martinez (.364, 7, 41), first baseman Kody Hinze (.307, 12, 55) and second baseman Jose Altuve (.280, 5, 22). Among the representatives of the first-place Crawdads are southpaw Robbie Ross (8-4, 1.92) and outfielder Miguel Velazquez (.287, 10, 44), who's tied for second in the league in RBIs. Dave Machemer of the first-place Augusta GreenJackets will manage the South Division stars, while Hickory's Bill Richardson calls the shots for the North. * On the North roster, Hagerstown pitcher Trevor Holder (promotion) and West Virginia pitcher Nathan Baker (injury) will not play and are not being replaced on the roster. Lakewood infielder Jeremy Barnes (injury) will also not play and will not be replaced. For the South, Cory Rasmus replaces Rome's Arodys Vizcaino (promotion) on the roster after Vizcaino was promoted to Class A Advanced Myrtle Beach. Christopher Masters replaces Vizcaino as the starting pitcher. Charleston's Luke Murton (injury) will not play. Zoilo Almonte will replace him as designated hitter in the starting lineup, and Murton's roster spot will note be filled.